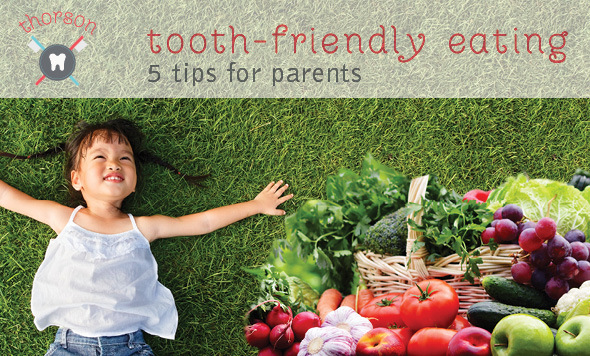 Proper eating habits are essential for strong, healthy teeth in your child. If you’re serving processed, refined and sugary foods in the home, not only is your child missing out on vital nutrients, they are much more vulnerable to tooth decay, starting from the first tooth. The solution? A little “tooth friendly” eating! 1. Stock your shelves with minimal child input. If children had their way, they would fill the pantry and fridge with unhealthy foods and drinks – a total disaster for growing teeth. Set the bar high for nutrition and make the home a haven for healthy eating. Don’t worry – your kids will have plenty to choose from. 2. Sweets have their time and their place. A crucial mistake that parent often make? Serving dessert after dinner. This becomes “the prize” for children eating their meal. You can give your child a sweet snack once in a while, just so they don’t feel deprived, but don’t make unhealthy foods a nightly reward. 3. Limit TV and computer time. With so much media out there, children are bombarded with advertising from food and drink companies, encouraging them to consume their unhealthy products. You should limit their exposure or guide your child to TV shows and websites that support healthy lifestyles for kids. 4. Get a headstart when your child is young. Food preferences begin early, so start giving your child healthy choices as soon as possible. You’d be amazed at the foods that smaller children grow to prefer when you start eating them at a young age. They can learn to love fruits, veggies, healthy grains, you name it! 5. Be a good role model for proper eating. You’re fighting a losing battle if you’re trying to teach your child good eating habits, but you don’t eat healthy yourself. Children will mimic their parents’ patterns. Choose nutritious foods, eat at the table, and don’t skip meals. Your child will learn to do the same.